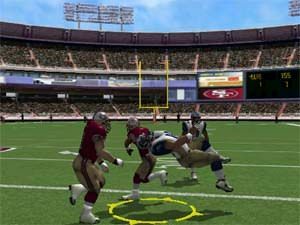 NFL Fever 2003 is the latest American football game from Microsoft game studios and allows you to play the entire NFL season from draft day to the legendary Superbowl. 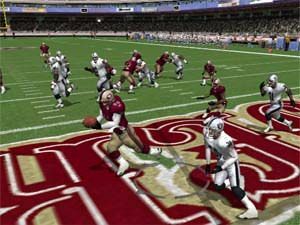 The competition between game studios is fierce when it comes to NFL but NFL Fever 2003 have raised the stakes with stunningly realistic graphics and even better multiplayer options. a new of tactic for your next gaming manoeuvre. The basics of NFL is that you must get the ball into the goals by any means possible, either by kicking or scoring a touch down. The game features many offensive and defensive tactics that help keep the game moving at a fairly good pace. The game controls are quite easy to master and your team has a variety of different moves they can perform such as pass, tackle, kick, block and run to name a few. NFL Fever 2003 also supports 4-player multiplayer action for some great gaming fun. Personally, I believe sport games are made for multiplayer action because they can become rather dull when you are playing solo. Graphically, NFL Fever 2003 features some amazing ingame graphics that will literally leave your jaw open. The players look quite realistic and feature authentic uniforms and some great facial expressions. The players are well animated but sometimes suffer from poor collision detection that may make the gameplay frustrating. Another problem of the game is that many of animations are repeated such as tackles and running. Apart from the well animated players, the teams feature their own cheerleaders that helps add to the atmosphere of the NFL season and there is also some realistic crowd effects, unlike the flat textures that many games portray as crowds. While NFL Fever 2003 features some amazing graphics, it is let down by the repetitive nature of the animations. NFL Fever 2003 features true Dolby Digital 5.1 surround sound and sounds phenomenal through surround sound speakers. If you have ever watched an American football game, the sound effects almost sound as if you are really there. The home crowd roars if you get a touchdown and there is various background sounds such as announcers and fans to keep the ambience of the game going. The game also features music by Clipse and American football commentators Kevin Colabro and Ron Pitts. The commentary has been professionally done and comes together extremely smoothly unlike AFL 2003 that suffers from long pauses between announcements. Sound wise, NFL Fever 2003 cannot be faulted. 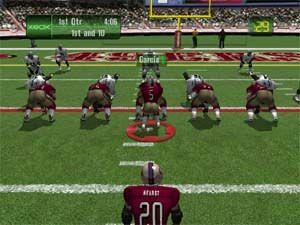 NFL Fever 2003 isn't the best game around when it comes to American football but it certainly has enough bonuses to keep you entertained. 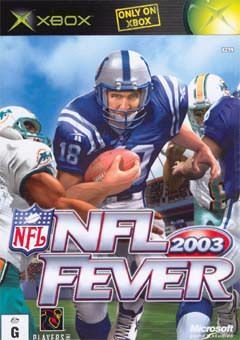 Unfortunately, the games graphics and gameplay doesn't go hand in hand but if you love multiplayer sport games, than NFL Fever 2003 is for you. Recommended to all NFL and sport fans.